Unlike many other sports, bodybuilding is something one can not only compete competitively in, but arguably peak at, well into their 40’s and sometimes 50’s. In today’s podcast, Andrea Valdez sits down with Brad Loomis and Jeff Alberts, to discuss what it’s like training and bodybuilding at the age of 45, compared to years prior. Can you still make progress in your 40’s? What are the advantages of competing in this sport when you’re older compared to younger? Disadvantages? What strategies have they incorporated to help increase their longevity and continued success in this sport. Along with covering these questions and breaking down their own situations, Jeff and Brad leave us with a few good memos. 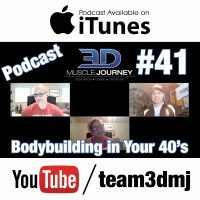 What advice do they have for the younger generation of bodybuilders who are still in their twenties? What is their best piece of advice for athletes in the same age group as themselves? Tune in this week to find out!